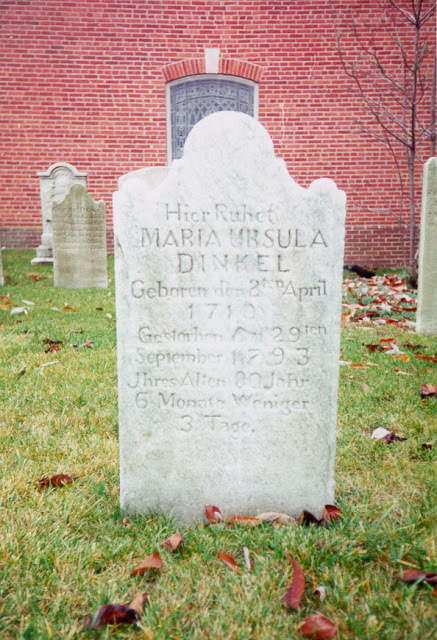 Maria Ursula (Von Ernest) Dinkel (1713-1793) is #203 on my Ahnentafel list, my 5th great-grandmother, who married #202 Johann Daniel Dunckel (1713-1755) in about 1735. Information about the Dunckel/Dinkel family was obtained from the book by Samuel Small, Jr., titled Genealogical Records of George Small, Philip Albright, Johann Daniel Dunckel, William Geddes Latimer, Thomas Bartow, John Reid, Daniel Denezet, Jean Crommelin, Joel Richardson (Philadelphia, Penn. : J.B. Lippincott Company, 1905). Maria Ursula Von Ernest was of noble birth. In a German Hymn Book (edition of 1733) of hers is the inscription: "Maria Ursula Duncklerin, Geborin Gornussin Von Colmar: geboren 1713, den 2 April" [Maria Ursula Dunckel, of noble birth from Colmar, born April 2, 1713]. According to a tradition, her father's name was Peter Von Ernest. The Von Ernest Coat of Arms consists of an anchor in a shield, above it a coat or tunic of armor, surmounted by a dove with olive branches in its mouth. Johann Daniel Dunckel married Maria Ursula Von Ernest in about 1735, probably in Strasbourg. They had six children between 1736 and 1748, probably all born in Strasbourg. At the 1742 baptism of their son, Peter Dinkel, the King and Queen of Prussia were sponsors. The baptismal cloth, a square piece of silk velvet with tassels, used on that occasion, was afterwards used in the baptism of Maria Ursula's grandchildren. After their emigration to America, Johann Daniel, Maria Ursula and their children settled in York, Pennsylvania. Maria Ursula Dunckel was called "Shiny Cap Dinkel" by the people of York, from the handsome cap and robe she wore, spangled with gold. She sat in state one day in the year to receive her children, grandchildren, and friends. The pews occupied by the family in Christ Lutheran Church, in York, were known as the royal pews, and were not allowed to be profaned by occupancy of the unaristocratic. She sold her jewels for $2000, and with the proceeds purchased a house on the south side of West Market Street, below Beaver Street. A large number of her descendants attained distinction in both civil and military life. 1. Samuel Small, Jr., Genealogical Records of George Small, Philip Albright, Johann Daniel Dunckel, William Geddes Latimer, Thomas Bartow, John Reid, Daniel Denezet, Jean Crommelin, Joel Richardson (Philadelphia, Pa.: J.B. Lippincott Company, 1905), page 124. 2. Jim Tipton, indexed database, Find A Grave (http://www.findagrave.com), Christ Evangelical Lutheran Cemetery, York, Penn., Maria Ursula Von Ernest Dinkel memorial #61249335. 3. Samuel Small, Jr., Genealogical Records of George Small, Philip Albright, Johann Daniel Dunckel, William Geddes Latimer, Thomas Bartow, John Reid, Daniel Denezet, Jean Crommelin, Joel Richardson, page 125, gravestone. 4. Samuel Small, Jr., Genealogical Records of George Small, Philip Albright, Johann Daniel Dunckel, William Geddes Latimer, Thomas Bartow, John Reid, Daniel Denezet, Jean Crommelin, Joel Richardson, page 129 (oldest child born 1736).